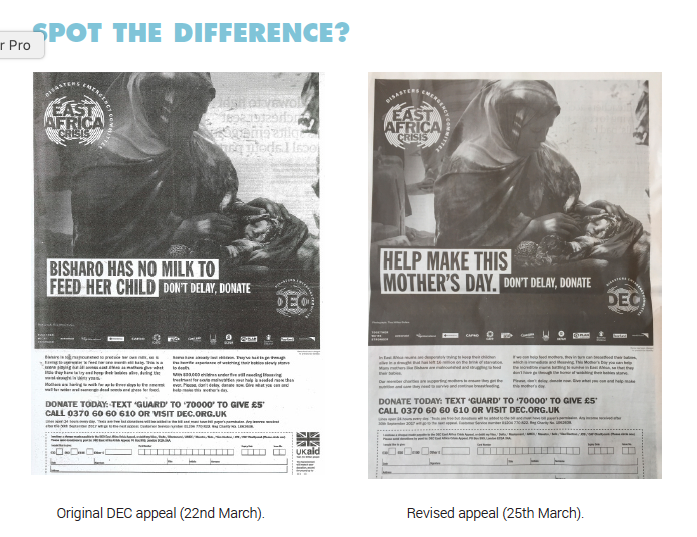 An example of messaging that can undermine breastfeeding and feed commonly held misconceptions. We are pleased that DEC has agreed to ensure that future appeals following our complaint about this full page appeal in the Guardian today. The importance of correct messaging about breastfeeding in emergencies. We applaud the UN and aid agencies for drawing attention to the crisis unfolding in South Sudan, Somalia, Yemen and Nigeria but appeal to the media and all involved to ensure that messages about infant and young child feeding are correct. 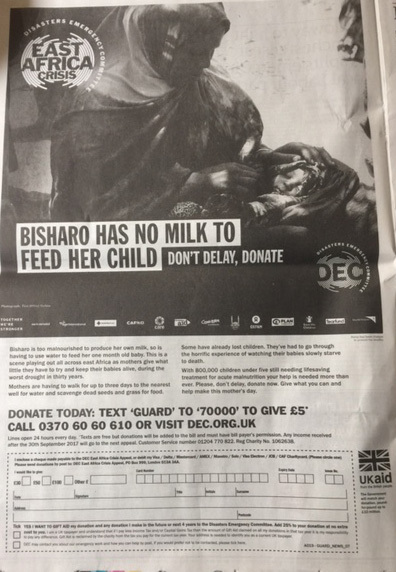 This appeal – Bisharo has no milk to feed her child – Bisharo is too malnourished to produce her own milk – sends a very unhelpful message about breastfeeding. Whether the claim about lack of milk is true in this particular instance is not really the point. The whole appeal feeds commonly held misconceptions about how breastfeeding works and what is really needed. UN and aid agencies all agree that humanitarian relief programmes must include training on how to protect, promote and support breastfeeding, as well as how to support non breastfed children in ways that do not undermine breastfeeding. Messages that suggest that women can’t breastfeed because of stress or malnourishment are not helpful and feed commonly held misconceptions. Mothers need support, protection, encouragement and reassurance – this is far more likely to help them maintain breastfeeding or relactate. Babies have specific nutritional needs and are born with an undeveloped immune system. For infants who are breastfed, breastmilk provides both food and immune support, which protects them from the worst of emergency conditions. However, the situation is very different for babies who are not breastfed. In an emergency, food supplies are disrupted, there may be no clean water with which to make up breastmilk substitutes or to clean feeding implements. Health care systems are invariably stretched past breaking point. This means that babies who are not breastfed are vulnerable to infection and to developing diarrhoea. Babies with diarrhoea easily become malnourished and dehydrated and so are at real risk of death. So whenever there is an emergency, it is extremely important that babies who are already being breastfed continue to be and that babies who are not breastfed re-start breastfeeding or, if this is not possible, are given infant formula in the safest possible way. For more on CLICK HERE for IBFAN page on Infant feeding in Emergencies.